Have you ever wanted to know how to use a compass? Can you look at terrain and draw a map? Do you love exploring nature? What is this workshop about? In this workshop, participants learn basic principles, skills, and applications of compasses, maps, and how they are used for orienteering. Why is this workshop important? Orienteering has become a lost art with the rise of GPS technology. But without our electronics, many of us are lost. 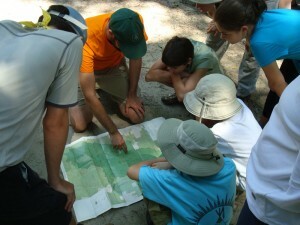 This workshop helps participants gain a true sense of direction, using maps, compasses, and clues in the natural world. What will we do? The workshop begins with an interactive discussion about maps, longitude, latitude, and the history of navigation. Then, the group builds primitive devices that can be used to measure latitude and longitude, and tests their accuracy using GPS technology. Next, participants each build a magnetic compass and learn the principles of compass-orienteering. Then the group uses their new compass and map skills to explore the Nature Preserve and create an annotated map of the greenspace. Finally, the group is introduced to geocaching (a GPS treasure-hunt game) and is able to hunt for several local geocaches within the Nature Preserve. What will we learn? Geography (including longitude, latitude, declination, solar noon, etc. ), astrophysics, history, engineering, physics, physical fitness, orienteering, hand-eye coordination, and survival skills.